Welcome to the Acorn User web site. 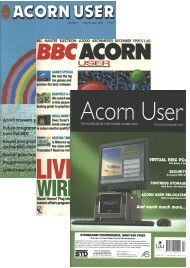 Acorn User merged with Acorn Publisher in 2004. Following Acorn's own demise it was felt a new name was required for the magazine, and so Qercus was born. The word Qercus is a subversion of the Latin word for Oak (Quercus). So from little Acorns a whole new era began. Over the coming months we will be building up the Acorn User and Qercus archives.